In 2003 we left the bright lights of Manchester and moved to Tenerife, an island which we hadn’t even set foot on until 12 months earlier. Being outrageous travel snobs, the idea of a holiday in the plastic, Brits-abroad theme park known as Tenerife was about as appealing to us as a wet Bank Holiday weekend in Coventry. But like so many people who have never been to Tenerife, and amazingly so many millions who holiday here year on year, we knew absolutely nothing about the real island – the one that lay beyond the souvenir shops and hotels on the south coast. Swimming against the tide of most British ex-pats, we chose to live in the subtropical north of the island, alongside banana plantations at the foot of the La Orotava Valley on the edge of Puerto de la Cruz. Once settled, we set about exploring our adopted home and were amazed to uncover its uniqueness as a walking destination. What we discovered is an island of incredibly varied landscapes which are criss-crossed by ancient paths dating back to the island’s first inhabitants. Unlike the smaller Canary Island of La Gomera, Tenerife is still not generally known as a walking destination and yet the presence of the planet’s third largest volcano set within a 17km wide crater of surreal landscape lifts its diversity of walking far beyond that of its neighbour. There are rain forests which have survived the Ice Age and which edge deep ravines where communities still live in caves; tiny hamlets whose inhabitants tend precipitous terraces by hand, and beautiful coastal paths which weave through palm groves. And because it’s not yet as well known a walking destination as it deserves to be, you can walk through mountains and valleys for hours and never meet another soul. From coast to coast and sea level to the summit of Mount Teide, we have walked Tenerife and have built this website to share our experiences with you. 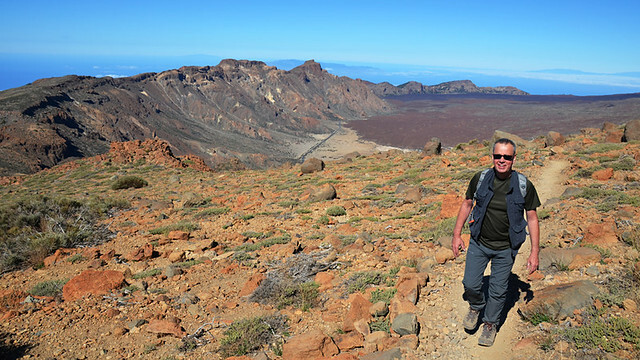 We want you not only to read our accounts, but to discover the joys of walking on Tenerife for yourself, which is why we wrote a series of step by step (literally!) guides to our favourite walks. 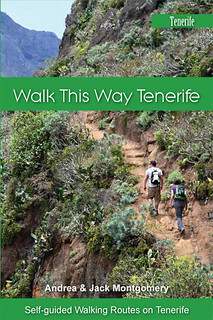 They proved so popular, and we were asked so many times if they were available in paperback, that we published Walk This Way Tenerife (available in Kindle too) with everything you need to know about self-guided walking on Tenerife and including four, fabulous bonus routes not available in PDF format. 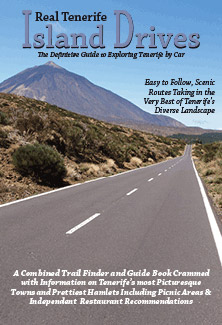 Real Tenerife Island Drives is a combined trail finder and guide book. Written for anyone who intends to hire a car on Tenerife, it details a series of amazing drives around the island that take you away from the tourist resorts and into the real Tenerife. 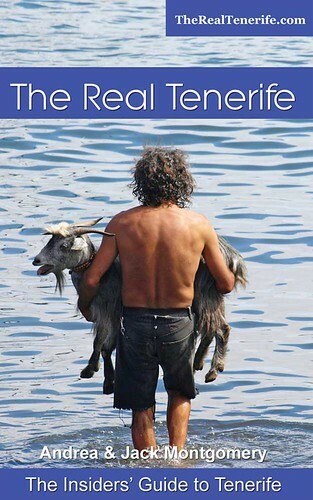 The Real Tenerife: The Insiders’ Guide is a comprehensive native’s eye view of the fascinating island of Tenerife; its people, places, language, fiestas, food and culture. I agree, Puerto de La Cruz is a lovely old town and traditional fishing port, where locals and visitors mix side by side. With lovely old streets and shady squares to sit with a coffee or ice-cream and watch the world go by, where views open out onto the clear blue waters of the Atlantic Bay. It’s a great place, Richard. I realise it’s not suited to everyone, but to us it’s a very, very special town. Hello, twenty years ago I went one Christmas to Tenerife for a lads holiday. About I all remember was hiring a car and driving through the climate zones up Teide. I have never forgot that amazing trip, arriving in the alpine zone, a blizzard… and nearly slipping off the edge. But now I am wondering, do think it is a good place to take my young family in the Autumn. We are tent campers, who love natuur and walking. You experienced some quite extreme weather up there 🙂 Most of the time it’s blue skies in Teide National park (although we are experiencing a huge Atlantic storm at the moment so if you were up there now it would probably be similar). Up until November you should be absolutely fine. In fact Sept/October is one of the best times when the weather is hot but not too hot and before the season changes (November and end of Feb/beginning of March are the dodgiest times). There’s a campsite quite near Teide National Park at Las Lajas above Vilaflor. It’s free and quite basic (great if you enjoy camping wild). When we camped up there we were the only ones there during the night. You need to arrange it with the authorities before turning up. We are visiting Tenerife for 35 days from mid-December until around 20 January staying in Playa San Juan. We have already ordered your guides so no worries there. However, we do not particularly want a car for the full period of our stay so my question is: how good is the public transport for your walks? Also would the weather be conducive to us attempting any walks in the Teide area? My partner is a really experienced walker. I am a relative novice who has been on a fitness/weight loss kick to prepare for our trip. We look forward with excitement to receiving your PDFs. Many thanks for buying the walks, which you should have received by now. There’s information about public transport routes from various areas included in each of the PDFs. The public transport system is very good but, like most places, the bigger the centre of population and the more popular a commuting route is, the better the public transport links. Which means that the south west and Playa San Juan is a lot more awkward to travel around from by local bus than say Las Américas, Santa Cruz or Puerto de la Cruz. It can be a bit convoluted to get to the start of walks, but not impossible. If anything, it’s nicer to walk in Teide National Park in December and January when the temperature is lower. There’s very little shade up there and, as it’s above the clouds most of the time, the sun can be relentless. Fabulous and unusual walking though. The only potential issue is if it snows and the authorities close the National Park. Usually the heaviest snows don’t fall until late January or February but it can vary from year to year. Walking on Tenerife is wonderful. 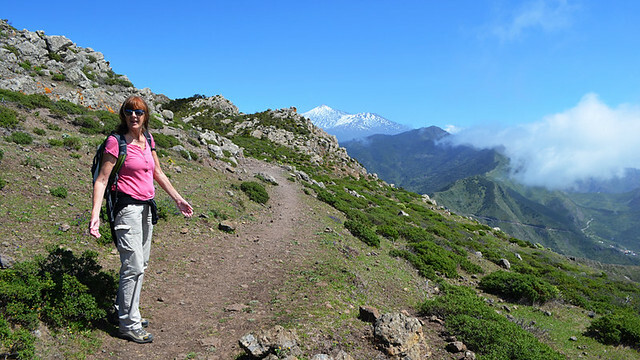 Having walked on most of the Canary Islands we think Tenerife offers some of the best because of sheer diversity and the fact that most people still think of La Gomera and La Palma more as hiking destinations, so you don’t meet as many people on a lot of the trails. I hope you have a great time and enjoy the walking. If there’s anything else you’d like to know, ask away. My husband and I plan on visiting Tenerife mid March. We plan on staying in the los criostanas area. are there any dates that you take out group that we could join up with etc. Thanks for your query but sorry, we don’t do guided walks. All the routes we advertise on our site are self guided ones. However, there are a few companies/guides in the south of Tenerife around the are you’re staying that do take groups. It was really good to meet you both. We enjoyed some great walks around San Miguel and then further up the hill during that week. We’re still working on the final touches to the guidebook and hope we’ll have it completed sometime in March. I’ll send you an email with some vertigo-free suggestions once it’s all finally put together. I’m going to Tenerife for just 3 nights in a couple of weeks and want to spend one day walking around Teide. I was going to stay in Puerto de la cruz and just catch the bus to the park before following a trail for a few hours before catching the bus back. Does this sound like a reasonable? And would you recommend Puerto de la cruz as a good base? I’m trying to get the balance right between things to do and see (without a car) and not being based somewhere overly built up. Thanks for your help in advance. Sorry Kate, we’ve been distracted by travelling. Puerto de la Cruz is an ideal base for walking and using public transport. The official Walking Festival (just finished) is based in the town each year. Your plan is sound, and at this time of year the Teide bus shouldn’t be so busy as it’s outside the main walking season. Is it definitely us you’re trying to contact? We’re Walking Tenerife not Tenerife Walking. Here are our contact details But there is also an Andy who takes walking groups in the south of Tenerife.